Many people, including me, have written extensively about the famous white limestone from Indiana. In my book Stories in Stone, I call the Salem Limestone, “America’s Building Stone,” and as far as I have been able to discover, it is the only building stone used in all 50 states. Recently, however, I have learned of another white limestone often mistakenly described as Salem. Much to my pleasure, being a native of Kentucky, that other stone hails from quarries in Warren County, Kentucky, in the southwest corner of the state. The publication further noted one unusual aspect of the stone—petroleum “impregnated” the rock. Oil gave the rock a dingy and unpleasant color when first quarried and carved, but soon the evaporation of the occluded petroleum left behind a stone of “great whiteness and remarkable beauty.” And it goes without saying that Bowling Green Oolite had superior strength and durability. Like the Salem, the Bowling Green Oolite, formally known as the Girkin Limestone, is Mississippian in age. The Girkin is most famous as the stone where the Mammoth Caves of Kentucky formed. The stone crossed state boundaries, with structures such as the U.S. Custom’s House in Nashville, TN and the Hall of Records in Brooklyn, NY; and religious boundaries, going into Methodist, Presbyterian, Catholic, and Episcopal churches, as well as a synagogue. 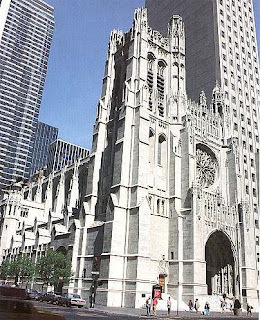 One of the most famous buildings is the Episcopal Church of Saint Thomas in Manhattan, finished in 1913, during the prime years for usage of white limestone from the Midwest. I suspect that most buildings that I think of as Salem Limestone are Salem, particularly in areas in the west, but I now know that some may have been mislabeled. I look forward to finding more buildings from my home state. Two New York comments. St. Thomas’s is not a cathedral. It is a beautiful Episcopalian church, though. In a later post you speak of going to the new Yankee Stadium. Check out the outrageous ticket prices first! It would be worth taking the subway to the site to see the building from the outside. Thanks kindly for the clarification. I have made the change. Also, yeah the prices do seem a bit steep!